Paw Print Genetics - Paw Print Genetics has Moved! Little Frankie is helping Paw Print Genetics move to their new location. 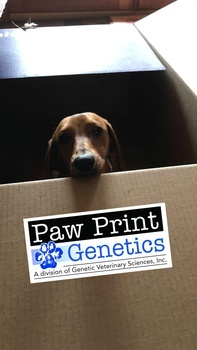 Paw Print Genetics has moved to our new laboratory! Our new address is 220 E Rowan, suite 220, Spokane, WA 99207. Our phone numbers remain the same at 509-483-5950 or toll free (US & Canada only) 1-855-202-4889. We have moved to more than twice our original space! For international shipping, be sure to place the US Customs form on the outside of your package to expedite your samples through Customs. If you currently have samples to send to us with one of our prepaid return mailers, you can still use that mailer, as all mail will be forwarded to our new address. Please let us know if you have any questions about shipping your samples to us. Thank you to ALL of our customers who keep us growing and innovating!